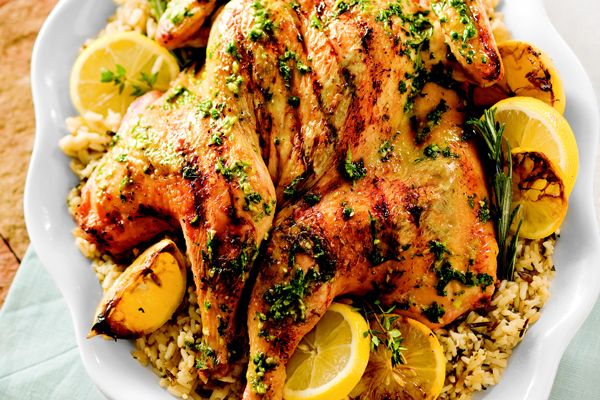 In this recipe cilantro is added to the classic pairings of lemon, garlic, rosemary and thyme making this dish just a little different than your traditional Greek chicken dinner. Place rosemary and thyme under chicken skin. Season chicken with salt and pepper. Place chicken, skin side down on grill. Grill for 5 minutes then turn. Close grill, reduce heat to medium, and continue to grill for 25-30 minutes or until an instant read thermometer inserted into the thickest part of the thigh reads 165°F (74°C).